For the last three weeks, Vulture has been holding the ultimate Sitcom Smackdown to determine the greatest TV comedy of the past 30 years. Each day, a different notable writer was charged with determining the winner of a round of the bracket, and it all ends now. Today New York Magazine TV critic Matt Zoller Seitz makes the final call to declare the ultimate champion: Will it be Cheers or The Simpsons? Read to see, and make sure to head over to Facebook to vote in our Readers Bracket, which has already veered from our critics’ choices. We also invite tweeted opinions with the #sitcomsmackdown hashtag. 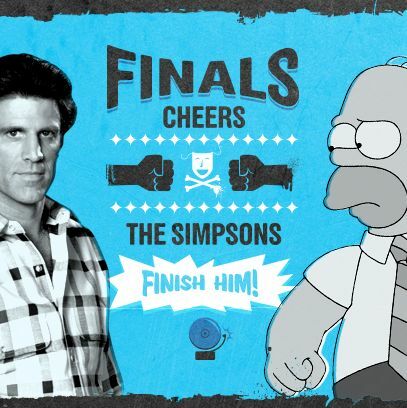 That line from season six’s “A Star Is Burns” film-festival episode suits this final face-off between Cheers and The Simpsons. Apples and oranges? Feh. This is apples and pineapples, or pomegranates and prickly pears. How to compare such wildly different TV comedies? What values should we prize in a contest like this one? Should the formal elegance and tonal consistency of all eleven seasons of Cheers count as an altogether greater achievement than The Simpsons’ broader, messier accomplishments: five genius-level seasons, another five intermittently wonderful ones, and another fourteen of solid B work interspersed with occasional A+ bursts of crystalline inspiration? Should we consider Cheers’ lack of 2013 pop-culture presence a demerit? Should we dock The Simpsons points for being an anything-for-a-laugh gag-fest, in contrast to the almost purely character-driven comedy of Cheers? Which show’s portrait of humanity is deeper? Which show would you rather rewatch? All of these questions matter, dear readers. And I struggled with them; oh, how I struggled! I furrowed my brow, gnashed my teeth, and rent my garments (someday I plan on buying them, he leered, waggling his Groucho cigar). I’ll supply a detailed re-creation of my Solomonic adjudication shortly, but first I’ll spare you the bother of scrolling to the end to find out who won — like you haven’t done that already! It’s The Simpsons. There is no other possible choice. I hate having to elevate one of these great shows over the other. They’re different in just about every way, starting with their scale. Cheers is minimalist. Over eleven seasons, probably 80 percent of its action took place in Sam Malone’s bar, his office, the poolroom, and the two stairwells leading, respectively, to the ground floor seafood restaurant Melville’s and to the street. Sam, his employees, and his patrons stayed put there as if waiting for Godot, or for Eugene O’Neill’s Iceman. (The Iceman Joketh.) The show’s creative staff — with a writers’ room initially led by co-creators Glen and Les Charles, and direction by third co-creator and workaholic James Burrows, who helmed 266 of the show’s 275 episodes! — perfected a unique tone, like a mildly raunchy TV cousin of screwball comedy, echoing Howard Hawks, Billy Wilder, and Ernest Lubitsch. And what a bunch of stuff! Every episode of The Simpsons is about television, comedy, popular culture, history, human nature, America, the world, the universe, time, space, head and groin injuries, gluttony, piety, lust, greed, hypocrisy, dogs, cats, living together, mass hysteria, parenting, marriage, maturity, immaturity, and the exquisite pleasures of the prank phone call, plus anything else that Groening and his murderer’s row of writers felt like stirring into the mix. The show’s format was gleefully elastic and inconstant; Sideshow Bob’s attempts on Bart’s life and Homer’s wanton destruction of Mr. Burns’s schemes were invariably forgiven and forgotten, just like so many momentous events in Springfield’s civic life. In this sense, The Simpsons feels like an inversion, or an explosion, of the Cheers format. Where Cheers respected the integrity of geography and time, The Simpsons blew geography a raspberry and gave time a wedgie — and that was the whole point. At the end of the season nine episode “Das Bus,” in which Bart, Lisa, and their classmates are stranded on a deserted island, returning guest narrator James Earl Jones suddenly chimes in to reassure us that the children were rescued by, “Oh, let’s say … Moe.” And why not? It’s all just drawings anyway. So what measurable criteria are we left with? Just two: consistency of vision, and overall impact. The Simpsons, in contrast, has always been entropic, all-encompassing, at times scattered, and it makes its all-over-the-placeness a point of pride. That explanation doesn’t quite explain or excuse its dip in quality over 25 years. Everyone seems to agree that at some point it stopped being brilliant and became alternately amusing and tiresome, with occasional flashes of autumnal genius. (“All pumpkins are racist! The difference is, I admit it!”: “Treehouse of Horror XIX,” season twenty.) How many seasons can one legitimately label as classic? Plus, at a certain point, indestructibility trumps every other value — especially if the artists in question have earned a spot in the pop culture pantheon, as The Simpsons surely has. Put it this way: The Rolling Stones continued to record and tour for a solid 32 years after their last really good original album (1981’s Tattoo You), but no matter how many “Get off the stage, old man!” jokes you make, you can never take 1964–1981, or even 1964–1972, away from them. The brilliant early stuff put them in the pantheon and will keep them there. Those first five or ten or however many seasons of The Simpsons should assure Groening & Co. the same degree of permanence, or whatever passes for permanence in the firmament of pop culture. To explain why, I need to get personal for a moment. Not every day in the Seitz household is that Simpsons-heavy. But if you’re reading this piece, you can probably relate. A decade-plus past its prime, The Simpsons has a stronger presence in American life than Cheers, Seinfeld, Community, or any other sitcom you can think of. Since Matt Groening’s show debuted in 1988, not a week has gone by that I haven’t thought about it, quoted it, or heard someone else quote it. The writing staff’s vacuum cleaner has ingested so much data and imagery that it’s hard for a fan to think about a significant TV show, movie, play, musical, painting, song, fairy tale, myth, or historical incident without remembering how The Simpsons made fun of it. Cheers is a flawless pearl glinting on a beach. But The Simpsons is the beach. It’s bigger than Cheers, bigger than sitcoms, in some ways bigger than television. It’s our virtual Smithsonian and Library of Congress, our collective data cloud, the Force, or Farce, that surrounds us, binds us, and holds the galaxy together. The Simpsons losing the Vulture comedy bracket? That’s unpossible.